Lose weight hunger-free thanks to our unique and proven EasyPlans — customized to your goals — with full support, backed by science. We know which foods keep you full while you reduce calories. Whether you’re a kitchen klutz or a cook, we have delicious options for you. With no need for willpower, and no suffering. iDiet’s science provides life-changing and permanent success. OnDemand is our newest and most convenient program. Until now, you’ve needed to attend live online groups to learn the iDiet hunger-free weight loss method. iDiet OnDemand packages the iDiet experience into convenient video lessons you can watch on your own schedule. Receive all the resources and knowledge you get with a regular iDiet group, but in a convenient self-paced recorded video program. iDiet OnDemand is designed for busy people who want to dive right in and get direct, immediate access. You can participate in this 10-week video program on your own schedule, and with as much or as little group sharing as you wish. Join in the forum discussions or just use our reference materials on your own. The choice is up to you! Be among the first to benefit from our newest, most time-flexible program. With iDiet OnDemand, you’ll receive an extraordinary level of education and support. Our video lessons, easy food plans and helpful online support will help you achieve your weight loss goals and learn to avoid weight regain… once and for all. Our life-changing process is enhanced by our unique iDiet Meal EasyPlans as well as online tools like our Weight Tracker, iDiet Recipes and iPhone app. On-Demand video lessons, to watch at your own pace, on your own schedule. We’ve captured everything good about our live group process in easy video lessons led by Dr Roberts and her team. 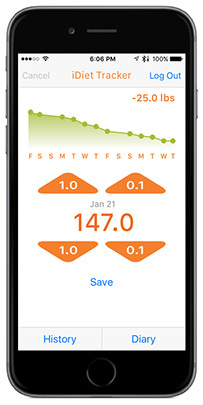 All iDiet groups also get access to our new iPhone app for weight logging and food journaling. Log your meals privately or share them for more support. iDiet is the only weight loss program clinically proven to Retrain Your Brain™ to crave healthier foods, and also the only diet program ever proven to reduce hunger during weight loss (Batra et al 2013). iDieters are actually less hungry while losing weight than they were before. No other diet plan can say that. You can lose weight without hunger or cravings, and maintain your new healthy weight without struggle. You’ll eat delicious real food, make better food choices, and feel in control. 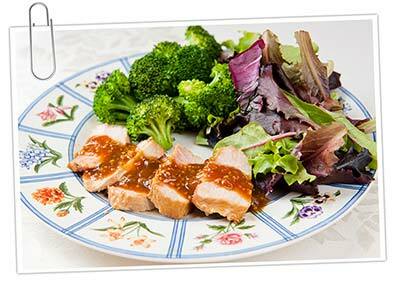 iDiet’s science-based real-food meals keep you full and satisfied, which eliminates the need for willpower. You won’t have to fight your hunger, because you won’t be hungry. Our comprehensive education, habit change techniques, friendly group support, web site and app keep you motivated while you learn. Finally achieve your weight loss goal and sustain it – for life! Feel more energetic and youthful — with the iDiet you can look good and feel good. We’ll stand by you all the way as you Retrain Your Brain™ to change your relationship to food. We’ll help you lose weight and gain better health, vitality and an exciting instinctive control over food. While other diets overpromise, the iDiet is clinically proven to deliver an average weight loss of 25 pounds in 18 weeks. That’s 2 ½ times higher than other programs. Incorporating the best nutrition, psychology and neurobiology findings, our groundbreaking meal plans address your basic hard-wired food instincts and help reprogram a lifetime of eating habits. Our unique meal plans keep you feeling full and satisfied. You’ll be hunger-free while losing weight and enjoying foods you love. iDieters rave about our fantastic no-cook meals and delicious yet easy recipes. You’ll enjoy a wide variety of mouth-watering foods, including old favorites such as chicken parm, burgers and chocolate desserts. We incorporate life-changing psychology and neurobiology for unprecedented success. You’ll develop natural control over food choices, reducing temptation, eliminating both cravings and emotional eating. Watch videos on your own schedule, choose what you want to eat from the simple meal plans, enjoy, and repeat. Our powerful science and behavioral help are built into customized EasyPlan menus, plus simple effective strategies for every daily challenge. Take prerecorded video classes (weekly), or attend live online group meetings (weekly). Dr. Roberts, author of the groundbreaking book The “I” Diet and more than 200 clinical studies on nutrition and weight loss, decided she had to become a “diet doctor” because she had discovered the secret to lifelong weight loss…and lives transformed. 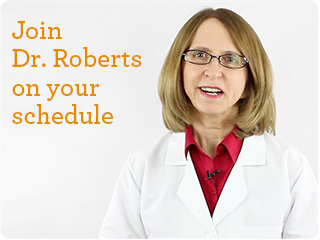 Dr. Roberts has collapsed her advanced nutrition science down into simple, doable, delicious menus. To succeed on the iDiet, all you have to do is follow the menus. And because Dr. Roberts worked as a chef before her career as a scientist, her iDiet recipes are delicious. Discover Group-based Weight Loss That’s Hunger-Free and Works! If you are tired of dieting and are looking for lasting change, join us. Once and for all, get power over food, lose more weight without hunger or giving up foods you love, and maintain your new healthy weight without struggle. Lose weight at the maximum healthy rate, and keep it off without effort. Make better food choices and crave healthier foods. iDiet doesn’t rely on willpower or deprivation, but rather on science-based real-food meals that keep you full and satisfied, coupled with comprehensive education for habit change, and friendly support to keep you motivated while you learn.